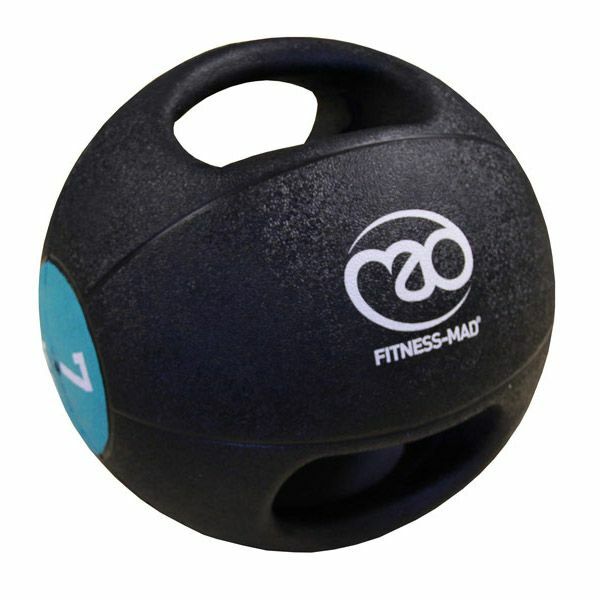 The Fitness Mad 7kg double grip medicine ball has all the features of a standard medicine ball plus two comfortable handles, which let you exercise with the weight kept further from your body, and generally increase the number of possible exercises. Despite having the handles, the ball remains a perfect sphere. It can be inflated or deflated to the optimum hardness. Made from one piece of rubber, the ball is waterproof and suitable for indoors and outdoors use. for submitting product information about Fitness Mad 7kg Double Grip Medicine Ball We aim to answer all questions within 2-3 days. for submitting product information about Fitness Mad 7kg Double Grip Medicine Ball. We aim to answer all questions within 2-3 days. If you provided your name and email address, we will email you as soon as the answer is published. for submitting product review about Fitness Mad 7kg Double Grip Medicine Ball.